Happy New Year from Office! 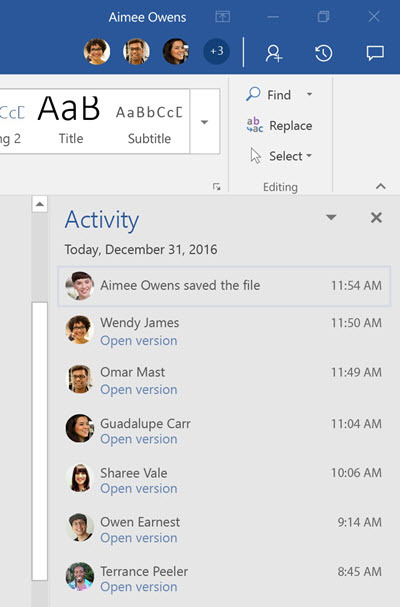 We’re kicking off 2017 with updates to OneDrive, the Activity feed within the Office apps, Microsoft StaffHub and more. Read on for the details. 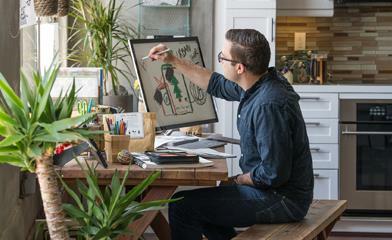 Today, we are announcing several enhancements to OneDrive for commercial customers. Now you can use the latest client to sync SharePoint Online team sites and OneDrive for Business shared folders, providing you with easy access to your shared documents. On the web, we have simplified the sharing experience, helping you better specify scope and duration for sharing permissions. OneDrive is also easier for IT to deploy and manage with the new OneDrive admin center and a standalone Mac client. Learn more about the details, availability and more in today’s OneDrive blog. Easily access more of your shared files by syncing SharePoint Online team sites and OneDrive for Business shared folders. Availability: Syncing SharePoint Online team sites and OneDrive for Business shared folders is now available for commercial customers in OneDrive on Windows desktops and Macs. The simplified sharing experience in OneDrive on the web and new OneDrive admin center are now available for commercial customers. The standalone OneDrive sync client for Mac is now available for commercial customers. In April, we introduced an activity feed in Word, Excel and PowerPoint for documents stored on SharePoint or OneDrive for Business—one of many updates bringing the collaboration experience front and center within the Office apps. Now this experience is available for consumers who store their documents on OneDrive. This means all subscribers can now stay on top of changes to shared cloud documents by accessing a full history of changes, as well as easily opening or even reverting to a prior version as needed. Get started with the Activity feed in a few easy steps. The Activity feed provides access to a full history of document changes, including prior versions. Availability: The Activity feed is currently available in Word, Excel and PowerPoint on Windows desktops, for commercial Office 365 customers. 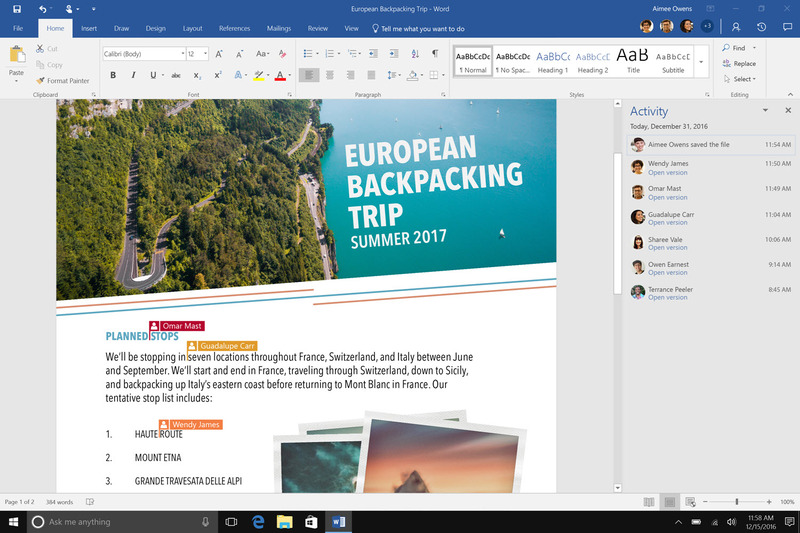 It is now available in Word, Excel and PowerPoint on Windows desktops, for consumer Office 365 subscribers in the Office Insider program. Office Lens is a pocket scanner for digitizing notes from whiteboards or blackboards, as well as capturing documents, business cards and more. Now we’ve started integrating its technology directly into the camera capture experience in Word and PowerPoint on Android. This means that directly from within Word and PowerPoint, you can capture, crop, straighten and enhance pictures of whiteboards. This can help students summarize classroom lecture notes and diagrams into a document, professionals capture diagram mockups into a presentation and more. In the future, we’ll expand this option to Excel and integrate additional Office Lens capabilities, such as document capture, Optical Character Recognition (making handwritten text within captured searchable) and more. Stay tuned! Office Lens integration in Word and PowerPoint on Android helps you capture, crop, straighten and enhance pictures of whiteboards. Availability: Office Lens whiteboard capture capabilities are currently available in Word and PowerPoint on Android. Office Lens is also available for download on Windows Mobile, iOS and Android. The Office Insider program is now available for iPhone and iPad, building on the program’s expansion over the last year and more. Leveraging Apple’s TestFlight program, Office Insider for iPhone and iPad offers early access to builds of Word, Excel and PowerPoint at the Insider Fast level. This is best for Insiders who want to use the earliest preview builds—released more frequently—and who don’t mind a bit of risk using unsupported builds to identify issues and provide feedback to help make Office great. Apply for a spot in Office Insider for iPhone and iPad or learn more about the Office Insider program. Availability: Office Insider for iPhone and iPad is currently available with limited capacity (learn more at Office.com/insider). Follow @OfficeInsider for updates and support. Earlier this month, we announced the general availability of Microsoft StaffHub, a new app for Office 365 designed to help staff workers manage their workday. Managers can easily create and adjust shift schedules, which employees can access from their mobile device. Employees can also access documents, videos and other information directly within the app, as well as send quick messages to each other or to the entire work group. Microsoft StaffHub will soon integrate with Kronos (a leading workforce management solution). Stay tuned for more! With Microsoft StaffHub, managers can easily create schedules, staff can easily view shift information and more. Availability: Microsoft StaffHub is enabled today for Office 365 subscribers with a K1, E1, E3 or E5 plan (including the Education version of these plans). Team managers can sign in at staffhub.ms, and employees can download the app on iOS or Android.